Avebury, in Wiltshire, in the south-west of England, is a well-known paranormal hotspot. In fact, there are so many paranormal events and phenomena associated with Avebury, that I cannot possibly cover it all in one article. 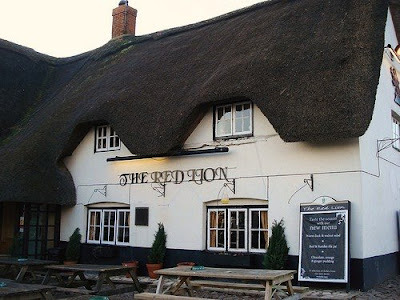 I'd like to start off by telling you about Avebury's famous Red Lion Inn, which is one of the UK's most haunted hotels. Much of the village, including the Red Lion, is enclosed within an ancient stone circle. 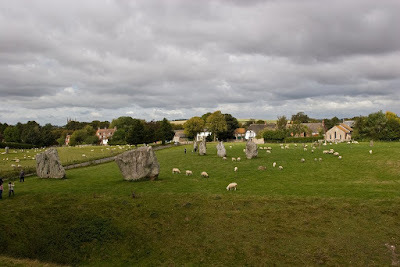 There are several small stone circles at Avebury, as well as a large henge. Avebury is located just twenty miles from the much better known Stonehenge, and at least two thousand years older. The tiny village is regarded as a spiritual centre for numerous pagan groups, such as the Druids and Wiccans. It has been the subject of many paranormal TV shows, including the very popular Most Haunted. In October 2004, the Swindon-based Paranormal Site Investigators carried out a ghostwatch at the pub. The Red Lion's best known spirit is that of a former landlady, Florrie. Local legend describes how Florrie had a number of illicit dalliances whilst her soldier husband fought in the English Civil War, which took place from 1642-1651. Her husband returned home and discovered Florrie's infidelity. He murdered her and concealed her body by pushing it down the village well. The Red Lion later expanded around the well, which now serves as a focal point in one of the restaurant's dining rooms. Florrie's murder was not the only one to occur at the Red Lion. It is also believed that a local man was stabbed to death in the cellar during the 17th century. At the time, the cellar was used to conceal criminals, and priests escaping the wrath of the anti-Catholic monarchy. 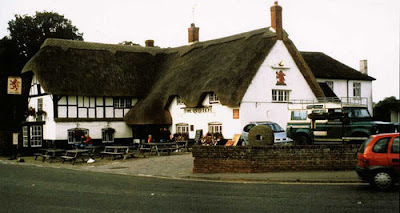 It was on 1st October, 2004, that a dozen members of Paranormal Site Investigators arrived at the Red Lion, to carry out an all-night vigil. They were accompanied by a local press photographer. They witnessed a great deal of anomalous activity, some of which was photographed. The activity experienced included mysterious footsteps, appliances turning themselves on and off, light anomalies, and people being touched by an unknown source. An object was also hurled down the stairs, from the bar to the cellar, where the investigators had based themselves. No-one was anywhere near the area of the bar from which the object was hurled. One member of the investigative team, who was ignorant of the inn's history, had a particularly disturbing experience. He had a terrifying vision, in which a man came up to him and made a number of violent, stabbing motions with a dagger. The pub's staff later revealed that a man had been stabbed to death in the cellar. Staff who enter the cellar regularly feel an angry and menacing presence within. A closer look at the Red Lion. Image: carboncopyrocks! Many writers and investigators believe that the Red Lion's location, in the middle of one of Europe's largest stone circles, plays a key role in its paranormal history. Do stone circles attract paranormal events? Or perhaps paranormal events have occurred at such sites for millennia, and prehistoric man built the circles in recognition of these phenomena. It's impossible to know for sure, but having had a very bizarre experience of my own within an ancient stone circle, I'm convinced some unusual kind of energy exists at some of these sites. That was a really interesting read. I've always been curious about stone circles. I just wanted to say I love your blog, your layout is really awesome too. I hope it's okay with you, I'm added your link to my favorite links on my Paranormal blog. It's pretty new and I'm just getting started, I'd love for you to check it out and let me know what you think. Any advice/comments would be much appreciated!!! I came here a few years ago with my family. At the time I didn't think much of it, but the nights after we visited the stone circle & Avebury I suffered from many severe 'night terrors' - similar to nightmares although the victim can be awake yet still experience the dream, which tend to be much more vivid and shocking that most nightmares. I'd never put two and two together until I heard about the paranormal activity in and around the stone circles and the Red Lion. Of course, it could just be a coincidence but if so, it's a thrilling coincidence - to think that I suffered from these night terrors after visiting one of the UKs paranormal hotspots is certainly quite chilling.